- 5.3" Inch Plastic Pots, 5.3" Inch Height. - These pot are suitable for succulent or tiny plants. 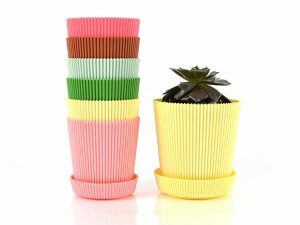 - 6 pcs pots with pallet Plastic Flower Seedlings Nursery pots 5.3". - The pot bottom has small holes to keep soil drained and ventilated.